The sun sets tonight on a flag flown at half staff on my font yard. 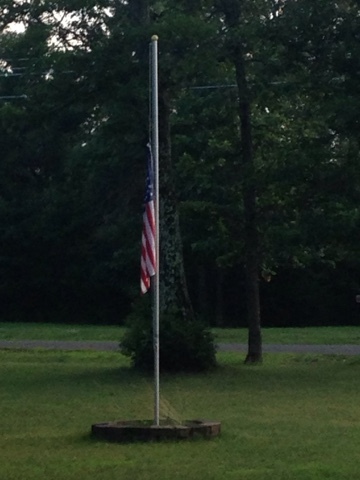 It has been lowered in honor for the four Marines who were murdered yesterday in Tennessee. Another senseless act. It's bad enough when something senseless like this happens, but it's even worse when it involves people and families you know. This morning I learned that one of the Marines is a native of my small town of 1,500 people. It is one of those little speed bump on the highway towns where everybody knows everybody. Directions are giving by turning at someone's house or farm, instead of street names and avenue numbers. Like many around me right, I'm still kind of in shock. Lowering the flag today was a different experience for me that is hard to explain. It was a very surreal experience. Something that happened over a thousand miles away has a very local and personal tie. I lowered my flag in respect for four fallen Marines. One of the Marine's mothers lives three miles down the road from me.